★UV LIGHT ATTRACTER & FAN :Double U 365 nm UV lamp,no pollution ultraviolet raditation,mosquito lure strength higherthan led bulbs,7 page fan,2200 RPM,strong suction mosquitoes. 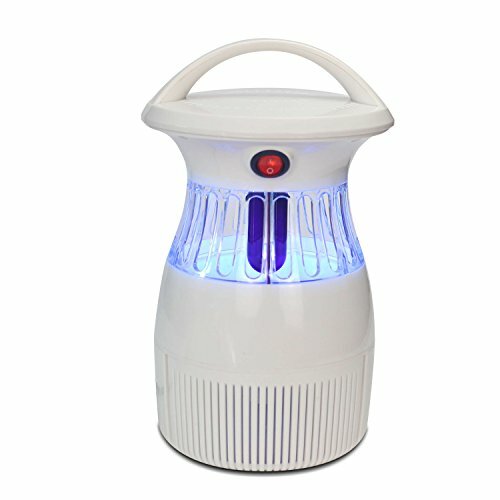 ★POWERFUL & LARGE AREA COVERAGE:360 degree effective light,large range of illumination and effective mosquito lure,the golden ratio volume,large range of killing mosquito, Effective for areas of up to 1000 sq. feet! ★SAFETY:Contains no pesticides, no insecticides, and is completely odorless.Get rid of all flying insects and bugs without the use of pesticides or dangerous chemicals or poison.maximum power only 12w,energy conservation and environmental protection. ★HYGIENE&EASY TO CLEAN : dead flies get trapped in a neat hidden tray located at the bottom of the device. To clean, simply remove the tray and wash with warm water; let it air-dry and it\'s ready for its next fly catching session. Simple, effective and clean! Indoor bug killer. Love it!